You can sleep under the stars. That may not be for everyone, I realize, but it’s nice to have the option should the mood strike you. You make a reservation to sleep in one of the 11 beds (1o aft beds and one huge bed forward). On the night you’re scheduled to slumber under the stars, you’ll find pajamas that have been custom embroidered with your initials, a nice touch. The room stewardesses prepare a beautiful bed with crisp linens and a bottle of champagne. Truly romantic. You can dine outdoors on some evening. True, a lot of ships offer this, but SeaDream’s vessels can seat the entire ship in the outdoor dining venue. There’s nothing quite like being off the coast of a small village in Italy or the south of France and dining within view of twinkling shoreline. There’s a much-used watersports marina. Other ships have marinas that lower from the back of the ship (Seabourn, Windstar) but in my experience, SeaDream gets the most use of its watersports toys, such as jet skis, sailing boats, kayaks, etc. Bonus. 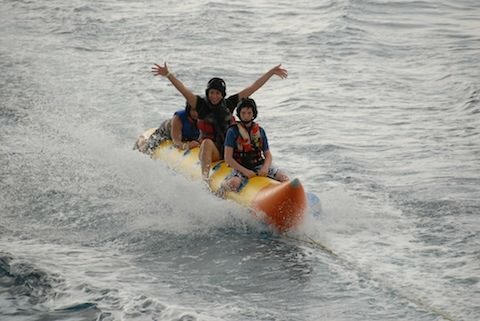 I forgot about one other thing I love about SeaDream. The captains will often lead walks or hikes or bike trips. The phrase “casually elegant” gets thrown around a lot, but those words are truly right on the mark when it comes to describing the two intimate 112-passenger ships of Seadream Yacht Club. The mostly 40- and 50-something couples who make up the bulk of their guest list appreciate the finer things in life — sans stuffiness. Dress codes are smart casual even at dinner and when not in port, daily life mostly revolves around hanging out on the mini cruisers’ open decks as the ships makes their way to off-beat ports in the Caribbean and Europe. 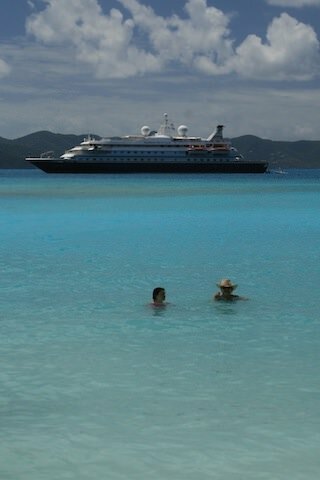 SeaDream, like having your own yacht. The ships often stay late in ports, say in St. Barts, so passengers can check out the local restaurant and pub scene. Otherwise, on board, evenings are spent socializing and enjoying cocktails at the Top of the Yacht bar, as a guitarist or piano player provides the background music. Occasionally a local band is brought on for some evening entertainment and one night per cruise a movie is shown on a large screen set up on deck under the stars. There’s also a tiny casino area with two poker tables and a handful of slots. The expansive open decks sport queen-size sun beds, a pool and a hot tub, the later a great place to enjoy a complimentary order of jumbo shrimp cocktail and a glass of bubbly. All you have to do is ask. The doting crew of 95 is there to please. Champagne & Caviar served in the surf. The ships’ two restaurants include excellent five-course dinners in the open-seating dining room and an al fresco restaurant on deck serves breakfast and lunch daily. Besides 24-hour room service, snacks served throughout the day may include homemade mini-pizzas. When in port in Jost Van Dyke or Virgin Gorda, a highlight of the week is a beach barbecue where champagne and caviar are served in the surf, followed by a full lunch on tables set up in the sand. It’s a blast. Other activities include having a go at the ships’ golf simulator or when the ships are anchored in calm seas, heading for the retractable marina for watersports and swimming. 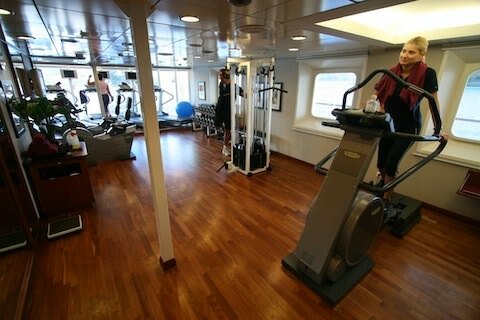 There’s also a spa and gym, and the ships each carry along 10 mountain bikes for use in certain ports. Readers of Conde Nast Traveler ranked SeaDream Yacht Club as one of the top 100 travel experiences worldwide. In fact, SeaDream was the only cruise company to be included in the listing. The other 99 winners were all hotels and resorts. Additionally, readers voted SeaDream ‘World’s Best Small Passenger Shipping Line,’ and the company achieved the highest overall rating of any cruise company — large or small. How do SeaDream’s twin yachts, both more than 20 years old, outperform all others — at least to readers of Conde Nast Traveler? On two SeaDream sailings over the past three years, I’ve identified ten reasons why SeaDream stands apart. Reason # 1 – SeaDream’s vessels are stylishly small . . .
carrying just 112 guests and able to get into ports that cruise ships can’t reach, including some idyllic coves and harbors and uncrowded beaches. The twin yachts are positioned November through April in the Caribbean and May through November in the Mediterranean. 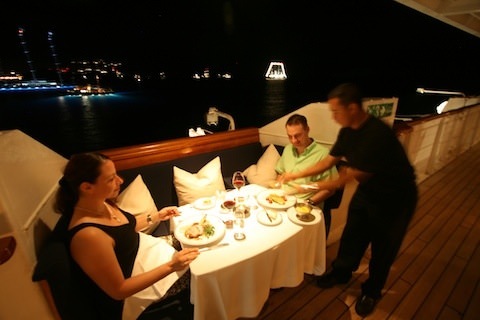 Also, most of SeaDream’s Yachting Voyages feature late night stays in port so that you can enjoy the night life. Reason # 2 – Small doesn’t mean sacrificing big-ship amenities. SeaDream vessels feature all ocean view staterooms with Bvlgari® bath amenities, the SEADREAM Spa – with 8 massage therapists and a member of the Thai Spa Association – the only one of its kind at sea, sauna, exercise room with the latest equipment and ocean views, beauty salon, casino, piano bar, library, large pool deck, Jacuzzi, boutique, 30 Course golf simulator, Top Of the Yacht Bar with 360 degree views, even a big screen under the stars and much more. SeaDream’s vessels can seat all guests at once in the outdoor dining areas. 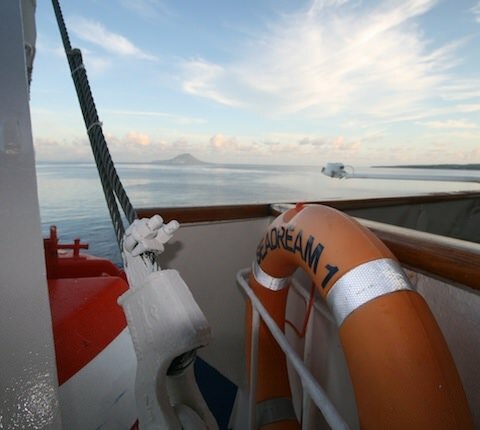 Reason # 3 – SeaDream vessels have something most ships don’t have. Outdoor dining . . .
Reason # 4 – SeaDream’s vessels feature an expansive marina . 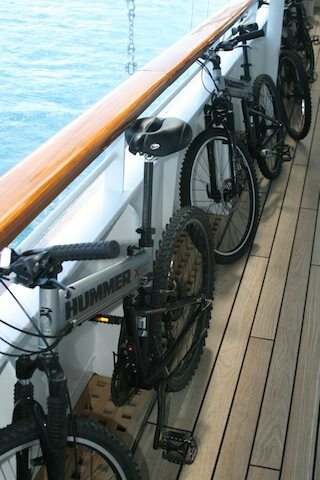 . .
For adventures ashore, SeaDream carries mountain bicycles. Reason # 5 – On SeaDream, you won’t pay extra for alcohol . . .
including fine wines and champagnes. The four bars on board feature select premium brands. Reason # 6 – You can sleep under the stars on SeaDream’s signature Balinese Dream Beds. Just make the request and SeaDream staff will provide turn down service and your choice of pillows, Belgian linens and a cozy duvet. 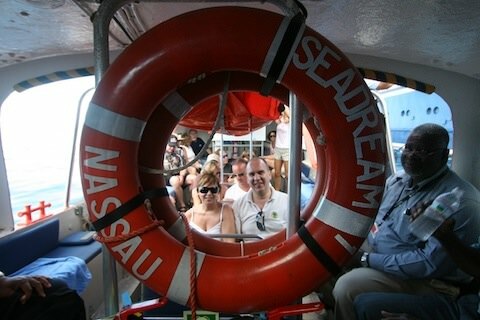 Reason # 7 – SeaDream has a high staff-to-guest ratio . . .
with nearly one staff person for each guest. Service is impeccable, with a maximum of 56 couples to 95 crew. On SeaDream, dress is resort casual and relaxed. 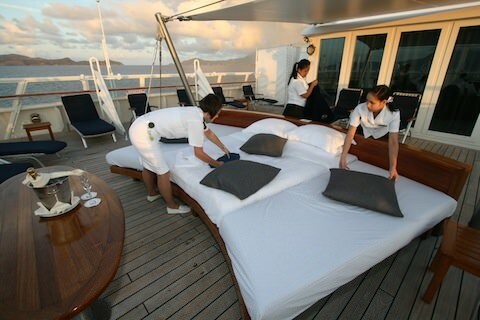 Reason # 8 – On board SeaDream, dress is resort casual and relaxed. Reason # 9 – There’s caviar and more caviar. 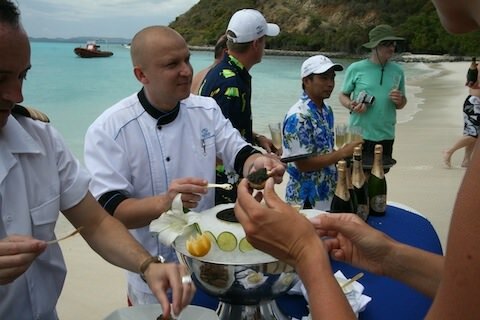 SEADREAM’S Champagne and Caviar Splash® is conducted on the beach in the Caribbean and is followed by a beach barbeque served on china — and around the Pool Deck in the Mediterranean. 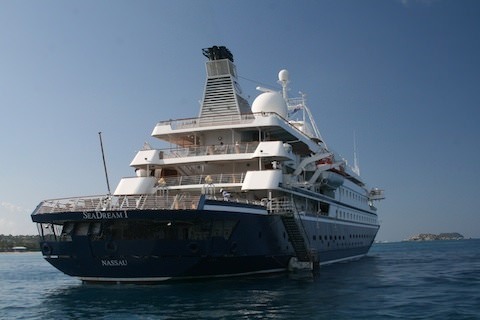 Reason # 10 – In essence, SeaDream is yachting not cruising. There is a difference. Good things do come in small packages. 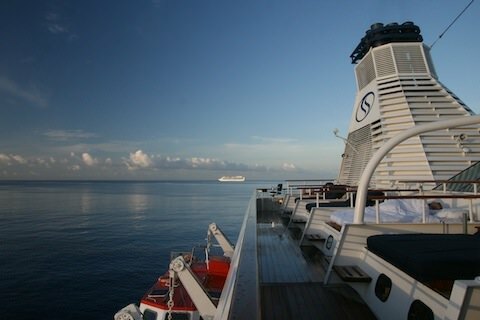 A beautiful day at sea on SeaDream. 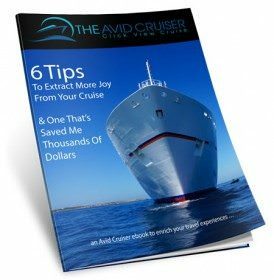 Want My Help With Your SeaDream Cruise? Two Caribbeans: Which Suits You Best? Big Ship Or Small Ship? Islands In The Stream: What Is Your Preference? Big Caribbean Island Or Small Island? Big Ship? Small Ship? 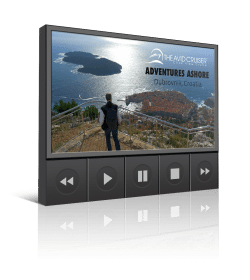 Which Is Better For Your Caribbean Cruise? Who Operates The World’s Best Luxury Cruise Line? A Luxury Cruise For Less Than $200 Per Day? SeaDream Yacht Club: World’s Best Travel Experience?